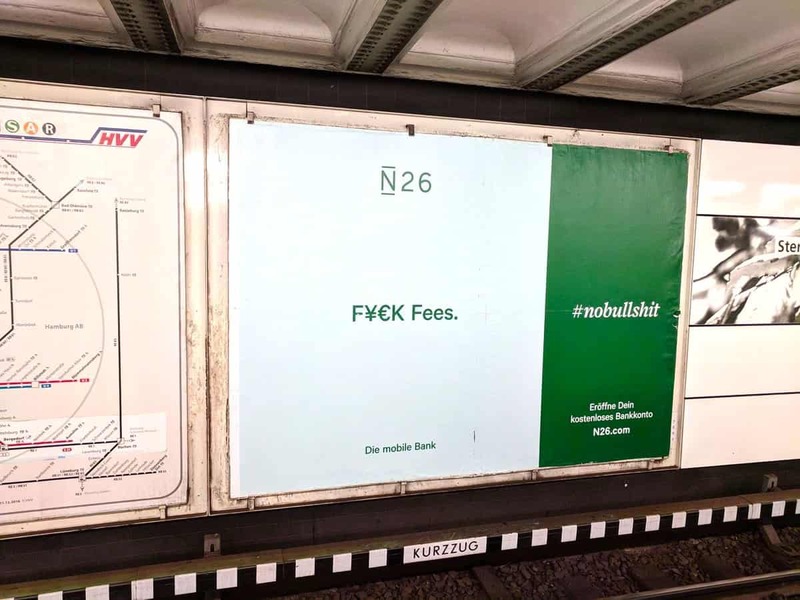 In a creative use of the English language, Berlin based digital challenger bank N26 is out with a promotional campaign that is rather blunt. As depicted below in a Tweet courtesy of @Skollma, N26 goes straight to the point and says F¥€K Fees. #nobullshit. The marketing campaign is apparently displayed in the Hamburg, Germany metro so there is a good chance it is being distributed across all lander in their home country. N26 announced this past June that it has topped 1 million European customers and €1 billion in monthly transactions. After raising $160 million in March, N26 should have plenty of fire power to tackle the slow moving banks of the past. Like other leading digital banks, N26 is mobile first and light on brick and mortar locations and the costly fees users pay to cover the real estate expense of dinosaur banks. Next up on the list is to cross the Atlantic and tackle the US – a market that is more than a bit different than the European banking world. Banking is highly fragmented in the US as thousands of banks, of all different sizes, operate across the country. Add this to the fact that the regulatory environment is a labyrinth of rules – both state and federal – and the market may a bit more challenger to tackle. But N26 is confident in its customer friendly Fintech approach and US consumers that interested in checking out N26 may register for early access today. N26 expects to be up and running in the US before the end of 2018. This entry was posted in Uncategorized and tagged banking, germany, n26. Bookmark the permalink.